The relationship between periodontal health and the restoration of teeth is intimate and inseparable. Maintenance of gingival health constitutes one of the keys for tooth and dental restoration longevity. An adequate understanding of relationship between periodontal tissues and restorative dentistry is paramount to ensure adequate form, function and esthetics, and comfort of the dentition. Despite an increased emphasis on the perio-restorative interface in restorative dentistry, many clinicians have been unable to utilize the concept of biologic width in a practical manner. Hence, the purpose of this paper is to describe the biologic width anatomy, evaluation and correction of its violation by different methods. A clinician is presented with three options for margin placement: 1. Supragingival, 2. Equigingival, and 3. Subgingival locations. 1. Preparation of the tooth and finishing of the margin is easiest 2.Duplication of the margins with impressions that can be removed past the finish line without tearing or deformation is the easiest with supragingival margins. 3. Fit and finish of the restoration and removal of excess material is easiest 4. Verification of the marginal integrity of the restoration is easiest. 5. The supragingival margins are least irritating to the periodontal tissue. The biologic width can be identified by probing under local anesthesia to the bone level (referred to as "sounding to bone") and subtracting the sulcus depth from the resulting measurement. If this distance is less than 2 mm at one or more locations, a diagnosis of biologic width violation can be confirmed. This measurement must be performed on teeth with healthy gingival tissues and should be repeated on more than one tooth to ensure accurate assessment, and reduce individual and site variations. In the Normal Crest patient, the mid-facial measurement is 3.0 mm and the proximal measurement is a range from 3.0 mm to 4.5 mm. [Figure 2]a. Normal Crest occurs approximately 85% of time. In these cases, the gingival tissue tends to be stable for a long term. The margin of a crown should generally be placed no closer than 2.5 mm from alveolar bone. Therefore, a crown margin which is placed 0.5 mm subgingivally tends to be well-tolerated by the gingiva, and is stable long term in the Normal Crest patient. High Crest is an unusual finding in nature and occurs approximately 2% of the time. There is one area where High Crest is seen more often: In a proximal surface adjacent to an edentulous site. In the High Crest patient, the mid-facial measurement is less than 3.0 mm and the proximal measurement is also less than 3.0 mm [Figure 2]b. In this situation, it is commonly not possible to place an intracrevicular margin because the margin will be too close to the alveolar bone, resulting in a biologic width impingement and chronic inflammation. In the Low Crest patient group, the mid-facial measurement is greater than 3.0 mm and the proximal measurement is greater than 4.5 mm. [Figure 2]c Low Crest occurs approximately 13% of the time. Traditionally, the Low Crest patient has been described as more susceptible to recession secondary to the placement of an intracrevicular crown margin. When retraction cord is placed subsequent to the crown preparation; the attachment apparatus is routinely injured. As the injured attachment heals, it tends to heal back to a Normal Crest position, resulting in gingival recession. However, the Low Crest attachment is actually more complex because all Low Crest patients do not react the same to an injury to the attachment. Some Low Crest patients are susceptible to gingival recession while others have a quite stable attachment apparatus. The difference is based on the depth of the sulcus, which can have a wide range. For example, If patient A is bone sounded and the mid-facial distance from the gingival crest to the alveolar crest is 5.0 mm, while patient B is bone sounded and the measurement is again 5.0 mm. By definition, both of these patients are Low Crest. However, they are not the same. Patient A has a 3.0- mm sulcus and a 2.0- mm attachment (i.e, epithelium and connective tissue). In contrast, Patient B has a 1.0- mm sulcus and a 4.0- mm attachment (ie, epithelium and connective tissue). [Figure 2]d Patient A has 3.0 mm of unsupported tissue from the base of the sulcus to the gingival crest. This amount of unsupported gingival tissue does not tend to be stable, and this patient is susceptible to gingival recession. However, Patient B has a more substantial attachment apparatus (4.0 mm) and a significantly shallower sulcus (1.0 mm). This patient is much less susceptible to gingival recession. Patient A is classified as an Unstable Low Crest because the patient is more susceptible to gingival recession. Patient B is classified as a Stable Low Crest because this patient reacts more like a Normal Crest patient and is not as susceptible to gingival recession. Biologic width violations can be corrected by either surgically removing bone away from proximity to the restoration margin, or orthodontically extruding the tooth and thus moving the margin away from the bone. Inadequate clinical crown for retention due to extensive caries, subgingival caries or tooth fracture, root perforation, or root resorption within the cervical 1/3rd of the root in teeth with adequate periodontal attachment. Placement of sub gingival restorative margins. Unequal, excessive or unaesthetic gingival levels for esthetics. Planning veneers or crowns on teeth with the gingival margin coronal to the cemeto enamel junction (delayed passive eruption). Teeth with excessive occlusal wear or incisal wear. Teeth with inadequate interocclusal space for proper restorative procedures due to supraeruption. Restorations which violate the biologic width. In conjunction with tooth requiring hemisection or root resection. Assist with impression accuracy by placing crown margins more supragingivally. Deep caries or fracture requiring excessive bone removal. Post surgery creating unaesthetic outcomes. Tooth with increased risk of furcation involvement. Unreasonable compromise on adjacent alveolar bone support. Crown lengthening of multiple teeth in a quadrant or sextant of the dentition, root caries, fractures. Apical repositioned flap surgery should not be used during surgical crown lengthening of a single tooth in the esthetic zone. This procedure is done when there is no adequate width of attached gingiva, and there is a biologic width of more than 3 mm on multiple teeth. As with any procedure, the patient needs to be informed of any potential complications such as possible poor aesthetics due to 'black triangles', root hypersensitivity, root resorption and transient mobility of the teeth. The health of the periodontal tissues is dependent on properly designed restorations. Incorrectly placed restoration margin and unadapted restoration violates the biologic width. If the margin must be placed subgingivally, the factors to be taken into account are: Correct crown contour in the gingival third; correct polishing and rounding of the margin; sufficient zone of the attached gingiva; and, no biologic width violation by the margin. Repeated maintenance visits, patient co-operation and motivation are important for improved success of restorative procedures with pristine periodontal health. 1. Felippe LA, Monteiro Júnior S, Vieira LC, Araujo E. Reestablishing biologic width with forced eruption. Quintessence. 2003;34:733-8. 2. Khuller N, Sharma N. Biologic width: Evaluation and correction of its violation. J Oral Health Co mm Dent 2009;3:20-5. 3. Robbins JW. Tissue management in restorative dentistry. Funct Esthet Restor Dent 2007;1:40-3. 4. Makigusa K. Histologic comparison of biologic width around teeth versus implant: The effect on bone preservation. J Implant Reconstr Dent 2009;1:20-4. 5. 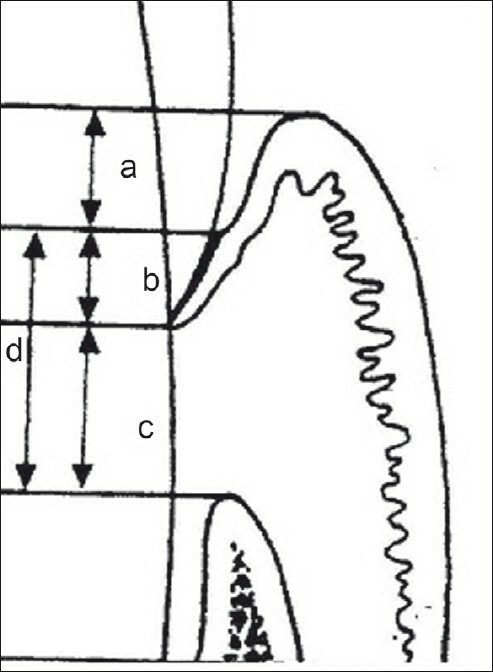 Gargiulo AW, Wentz FM, Orban B. Dimensions and relations of the dentogingival junction in humans. J Periodontol 1961;32:261-7. 6. Ingber JS, Rose LF, Coslet JG. The "biologic width"-a concept in periodontics and restorative dentistry. Alpha Omegan 1977;70:62-5. 7. Jorgic-Srdjak K, Plancak D, Maricevic T, Dragoo MR, Bosnjak A. Periodontal and prosthetic aspect of biological width part I: Violation of biologic width. Acta Stomatol Croat 2000;34:195-7. 8. Rosenberg ES, Cho SC, Garber DA. Crown lengthening revisited. Compend Contin Educ Dent 1999;20:527. 9. Nevins M, Skurow HM. The intracrevicular restorative margin, the biologic width, and the maintenance of the gingival margin. Int J Periodont Restor Dent 1984;4:30-49. 10. Olsen M, Lindhe J. Periodontal characteristics in individuals with varying form of the upper central incisor. J Clin Periodontol 1991;18:78-82. 11. Dhir S. The Peri-implant esthetics: An unforgettable entity. J Indian Soc Periodontol 2011;15:98-102. 12. Waerhaug J. Healing of the dento-epithelial junction following subgingival plaque control. II: As observed on extracted teeth. J Periodontol 1978;49:119-34. 13. Valderhaug J, Birkeland JM. Periodontal conditions in patients 5 years following insertion of fixed prostheses. Pocket depth and loss of attachment. J Oral Rehabil 1976;3:237-43. 14. Newman, Takei, Klokkevold, Carranza's Clinical Periodontology. 10 th ed. Philadelphia: Saunders, Elsevier Publishing; 2006. p. 1050-69. 15. Galgali SR, Gontiya G. Evaluation of an innovative radiographic technique- parallel profile radiography- to determine the dimensions of the dentogingival unit. Indian J Dent Res 2011;22:237-41. 16. Kois J. Altering gingival levels: The restorative connection, Part 1: Biologic variables. J Esthet Dent 1994;6:3-9. 17. Kois JC. The restorative-periodontal interface: Biological parameters. Periodontol 2000. 1996;11:29-38. 18. Robinson PJ, Vitek RM. The relationship between gingival infla mmation and the probe resistance. J Periodontal Res 1975;14:239-43. 19. Freeman K, Bebermeyer R, Moretti A, Koh S. Single-tooth crown lengthening by the restorative dentist: A case report. J Greater Houston Dent Soc 2000;2:14-6. 20. Jorgic-Srdjak K, Dragoo MR, Bosnjak A, Plancak D, Filipovic I, Lazic D. Periodontal and prosthetic aspect of biological width part II: Reconstruction of anatomy and function. Acta Stomatol Croat 2000;34:441-4. 21. Smukler H, Chaibi M. Periodontal and dental considerations in clinical crown extension: A rationale basis for treatment. Int J Periodont Restor Dent 1997;17:464-77. 22. Pontoriero R, Carnevale G. Surgical crown lengthening: A 12- month clinical wound healing study. J Periodontol 2001;72:841-8. 23. Elavarasu S, Kermani K, Thangakumaran S, Jeyaprakash GS, Maria R. Apically repositioned flap in reconstruction of mutilated teeth. JIADS 2010;1:63-6. 24. Heithersay GS. Combined endodontic-orthodontic treatment of transverse root fractures in the region of the alveolar crest. Oral Surg Oral Med Oral Pathol 1973;36:404-15. 25. Durham T, Goddard T, Morrison S. Rapid forced eruption: A case report and review of forced eruption techniques. Gen Dent 2004;48:167-75. 26. Murchison DF, Schwartz RS. The use of removable appliances for forced eruption of teeth. Quintessence Int 1986;17:497-501. 27. Uddin M, Mosheshvili N, Segelnick SL. A new appliance for forced eruption. N Y State Dent J 2006;72:46-50. 28. Wise MD. Stability of the gingival crest after surgery and before anterior crown placement. J Prosthet Dent 1985;53:20-3. 29. 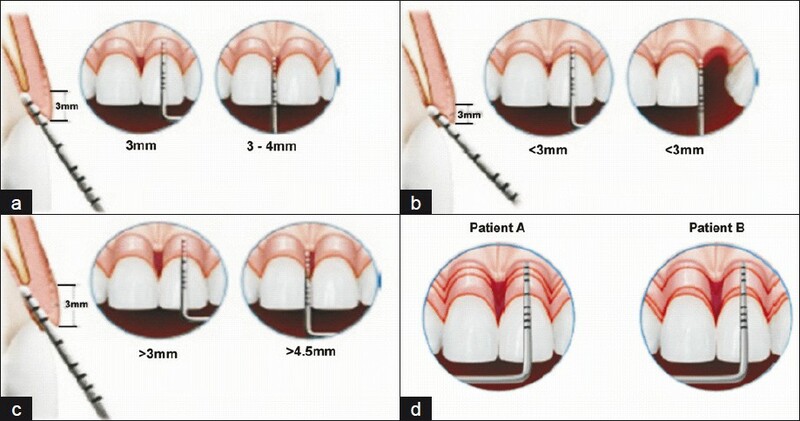 Shobha KS, Mahantesha, Seshan H, Mani R, Kranti K. Clinical evaluation of the biologic width following surgical crown lengthening procedure: A prospective study. J Indian Soc Periodontol 2010;14:160-7. 30. Robbins JW. Tissue management in restorative dentistry. Funct Esthet Restor Dent 2007;1:40-3.